A rapidly rising freezing level in the mountains — and another round of heavy rainfall Tuesday afternoon — presented an increased flood danger across Western Washington. Updates: For Wednesday-morning reports on floods, mudslides, power outages, road closures and more, see our most recent story. Original post, Tuesday, Dec. 8, 2015: Massive flooding will threaten swaths of Western Washington Wednesday, forcing residents near rivers to line their properties with sandbags and commuters to dodge pools of standing water. Emergency-management crews scrambled Tuesday to close roadways already affected by the flooding and warn residents of the upcoming danger. The flooding comes as another round of heavy rain, combined with warm mountain temperatures, sent swollen rivers over their banks. The weather service issued a series of statements throughout Tuesday detailing the flooding forecast, including a warning about the Skykomish, Snoqualmie, Snohomish and Tolt rivers. The freezing level climbed to about 8,000 feet Tuesday afternoon — some 5,000 feet higher than Snoqualmie Pass. At midday, rain was falling on Stevens and Snoqualmie passes, and each reported areas of standing water on the highways. Along the Skykomish River, meteorologists expected the floodwaters to spread from Index downstream and “inundate portions of downtown Sultan.” The river rose above flood stage Tuesday. Around 4 p.m. Tuesday, transportation crews were working to close roads near the town and caution drivers, Snohomish County Fire District 5 Chief Merlin Halverson said. Emergency-management officials before Tuesday sent warnings about the upcoming rain and flooding to Sultan residents, many of whom started lining businesses and homes with sandbags, he said. The floodwaters mostly threaten the south and west sides of town, including some downtown commercial properties along Main Street that run parallel to Highway 2, he said. The city has fought major flooding 10 times since 1980, the largest of which was on Thanksgiving in 1990, according to records cited on the city’s website. The Snoqualmie River reached severe-flood stage around 5:40 p.m. Tuesday, meaning deep water could move fast and flood low-lying structures, according to a King County alert. The Tolt River reached a moderate flooding stage about an hour later. A heavy-rains checklist from the public-private campaign “Take Winter by Storm” advises people in flood-prone areas to place things on high shelves and to stay out of flooded basements, which can pose a danger of electrocution. In the Monroe area along the Snohomish River, the flood warning says, “The river will flood many homes, cover much of the farmlands and close many roads.” Forecasters expected that river to hit flood stage about 1 a.m. Wednesday. Besides threats of flooding, Tuesday’s heavy rainfall created landslides, posing additional problems on some transportation routes. Crews temporarily reduced lanes in both directions on a stretch of Highway 2 west of Stevens Pass because of a mudslide Tuesday afternoon, according to the Washington State Department of Transportation (WSDOT). The roadway reopened less than two hours later. Crews cleared debris Tuesday from a mudslide the night before that canceled Northline Sounder service between Seattle and Everett, and freight-train traffic was able to resume. But as a precaution, passenger service remained closed. The soonest it could restart would be early Thursday, following an inspection that includes a “geotech evaluation,” said railroad spokesman Gus Melonas. 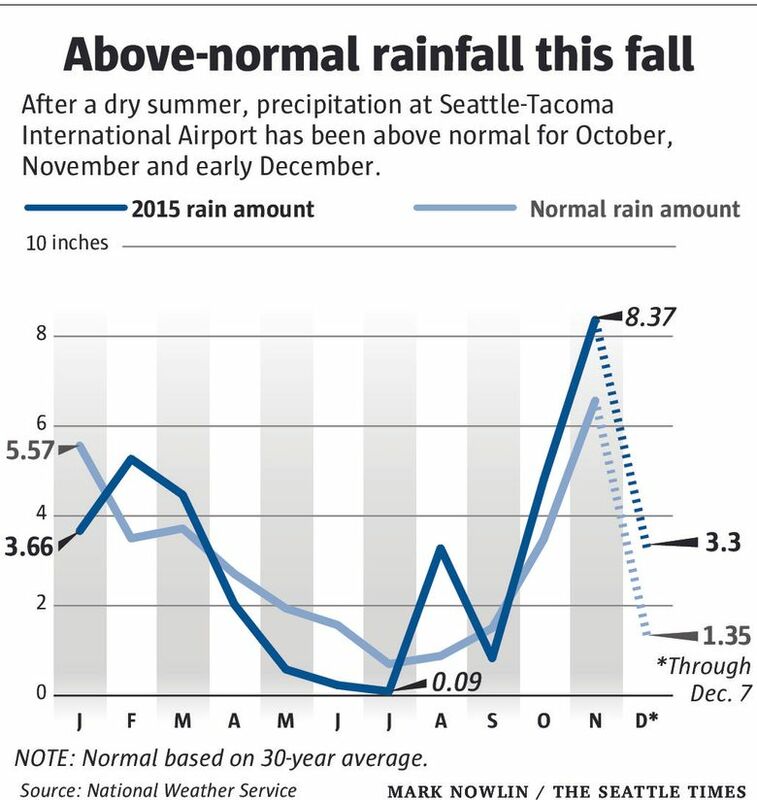 Early Tuesday, rainfall at Seattle-Tacoma International Airport so far in 2015 surpassed the 37.5 inches that normally falls in a full year — with 23 days to go. By 9:45 p.m., the airport had recorded 2 inches, breaking the record of 1.6 inches set in 1971 for most rain on Dec. 8. Tuesday was the ninth-wettest day for Seattle in the past decade, according to the weather service. The day’s temperatures broke records for Dec. 8, as well, with a high of 60 and low of 50 degrees, the agency said. Kirby Cook of the weather service likened the succession of storms to “a fire hose coming in off the Pacific.” The forecast for the Seattle area calls for rain — at least in the form of showers — each day for the next week. “Wednesday through the end of the week we are still going to be in a rainy pattern,” meteorologist Smith said. 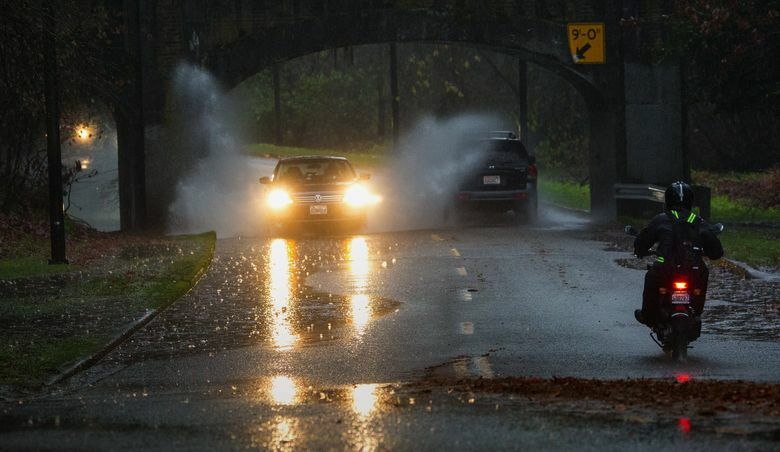 With the wet forecast, the weather service and emergency-management agencies are advising commuters to prepare for their drives Wednesday and not cross stretches of road that are underwater — the most common cause of flood fatalities in Washington. Drivers can check www.wsdot.com/traffic/trafficalerts/ for updates. “We want people to plan ahead when they wake up and check that their route is clear before they head out the door,” WSDOT spokesman Justin Fujioka said.